In 1944 Hellboy was conjured in a ceremony meant to give Hitler the ultimate occult weapon. Fortunately, Professor Trevor Bruttenholm was there to witness, and to guide Hellboy to become the world's greatest paranormal detective. But Bruttenholm wasn't the only witness to Hellboy's arrival. The Visitor: How and Why He Stayed reveals the aliens who monitored Hellboy's arrival on earth, and why the assassin they sent to earth stayed his hand. 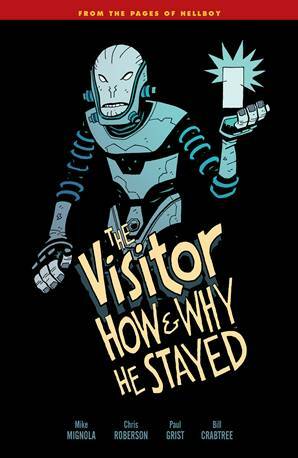 Collects The Visitor #1-#5 and the Visitor short story from the Hellboy Winter Special 2017. Provides backstory and answers questions about the origin of Hellboy in this fun tale about a myserious visitor who is sent to observe Hellboy!